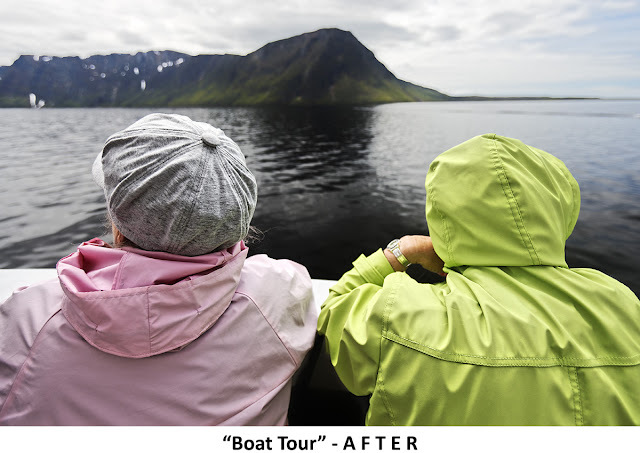 On a boat tour of Western Brook Pond in western Newfoundland two women focused on the spectacular scenery while I focused on them. The pastel colors of their windbreakers contrasted with each other and with the natural tones of the land, water and sky. The image tells a strong, simple story: two people awestruck by 600 meter (2000 foot) cliffs towering over a remote, pristine lake. This image required less work than many of the others featured in this blog. It's a good example of how even relatively modest adjustments can transform a photograph from merely "interesting" to "worthy of displaying". I wanted to separate the women from the landscape - make each part of the image stand out in its own right. I was taken by the colors and textures of the jackets so I increased vibrancy a little to bring out the color and used fine-contrast and tone curve adjustments to highlight the fabric's folds and shadows. I added drama to the background through tone-curve adjustments that increased contrast and deepened the cliff shadow that falls nicely between the two women. I made the textures of the cliff-face stand out a little more than in the BEFORE image. 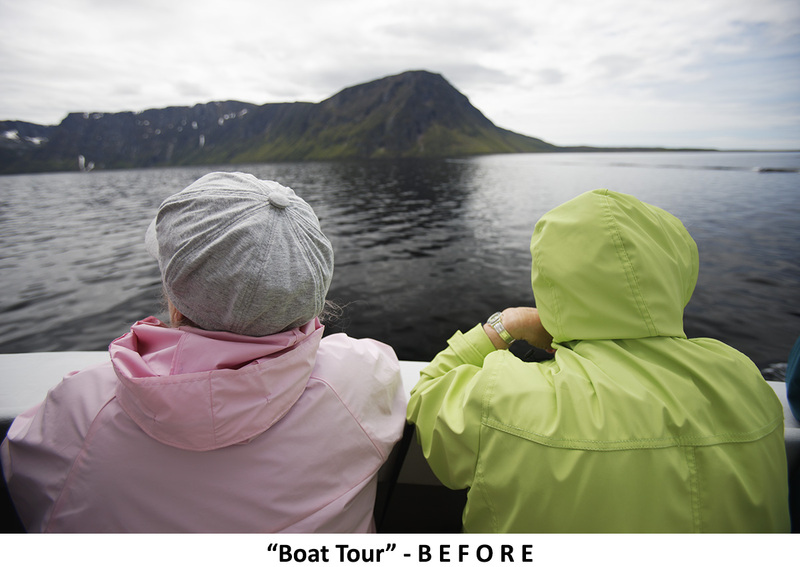 And I used fine-contrast adjustments to soften the surface of the water. The horizon needed straightening - it tilts to the left in the BEFORE shot. Finally, I cropped the image to draw the viewer into the frame and heighten the sense that you are standing right there behind the women watching the scenery with them.